EN Summary: I've finished BCN Unique's TREKY top this weekend (the APRON skirt is well on its way to completion) and I have loads of progress photos to share. Keep reading for the complete sewing review. 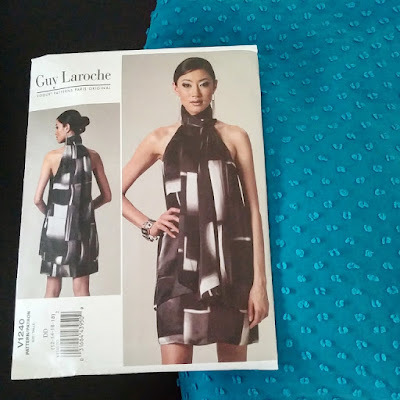 Photos of me wearing the Guy Laroche dress - As fotos a usar o vestido Guy Laroche! EN Summary: In this article you'll find photos of the finished garment, links to all the related progress articles and my final thoughts about this gorgeous dress. Keep reading, you don't want to miss out! 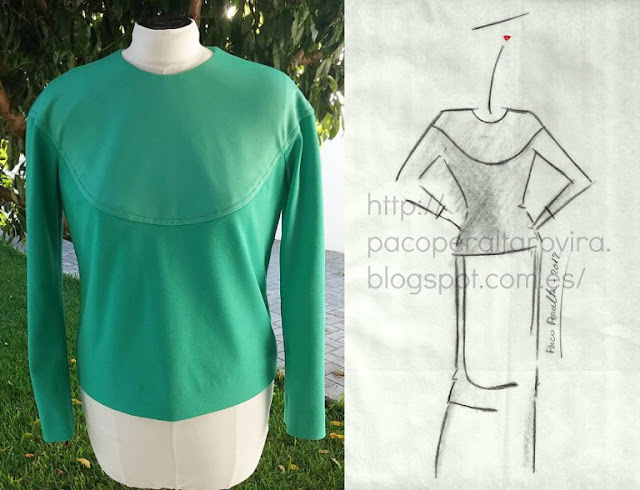 PT Sumário: Neste artigo encontram fotos do vestido terminado, enlaces para todos os artigos sobre a sua construção e as minhas considerações finais relativamente a este magnífico vestido. Continuem a ler o artigo completo, não vão querer perder nenhum detalhe! 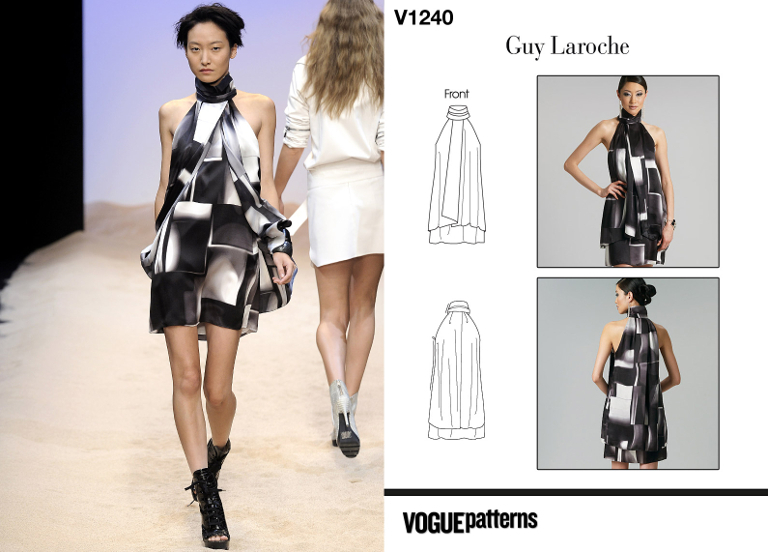 EN Summary: Are you intrigued about the collar of the V1240 Guy Laroche dress? I certainly was; this was the detail that first caught my eye about this dress. Today finished the collar and recorded all the steps along the way! Keep reading the full article! PT Sumário: A gola do vestido V1240 Guy Laroche intriga-vos? A mim sim, e foi o detalhe que me despertou mais a atenção neste molde. Hoje terminei a gola e tirei fotos de todos os passos. Continuem a ler o artigo completo! 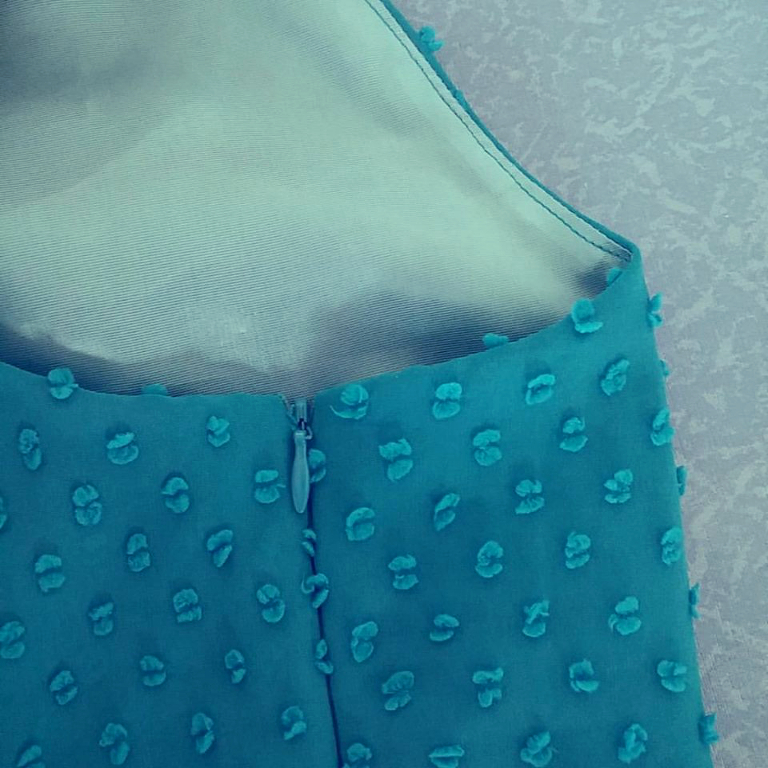 EN Summary: The dress is coming along quite nicely and today I managed to sew the lining and attach it to the dress. Keep reading for all the details. PT Sumário: O vestido está a ficar muito bem e hoje consegui fazer o forro e aplicá-lo ao vestido. Continuem a ler para verem todos os detalhes. EN Summary: The original dress has an invisible zipper on the side, but as I mentioned in my previous post, I find it hardly necessary. Even so I wanted to sew in the zipper so I picked a smaller one (9"). The challenge is using a textured fabric (the plumeti dots could get stuck into the zipper cursor) and also sew the zipper to two layers of fabric at once. Keep on reading if you wish to know a bit more of this process. PT Sumário: O vestido original tem um fecho invisível na lateral, mas como mencionei no meu artigo anterior, este fecho não é absolutamente necessário; mesmo assim quis aplicar um. Escolhi um fecho mais curto (22cm) e preparei-me para o desafio de coser o fecho a este tecido com relevo (as pintas de plumeti podem ficar presas no cursor), além de também ter de coser o fecho às duas camadas ao mesmo tempo (interior e panos exteriores). Continuem a ler para seberem mais acerca deste processo. 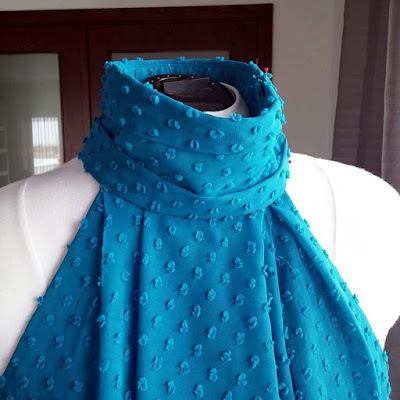 EN Summary: Currently on the making is the gorgeous OPP Guy Laroche Vogue Paris Original, made from Blue Sky Faux Dotted Swiss Polyester Chiffon. Keep on reading if you'd like to know the details about this project! PT Sumário: No momento estou a confecionar este magnífico vestido (molde descontinuado) Guy Laroche Vogue Paris Original, usando chiffon plumeti de poliéster azul. Continuem a ler se quiserem saber todos os detalhes do projeto! 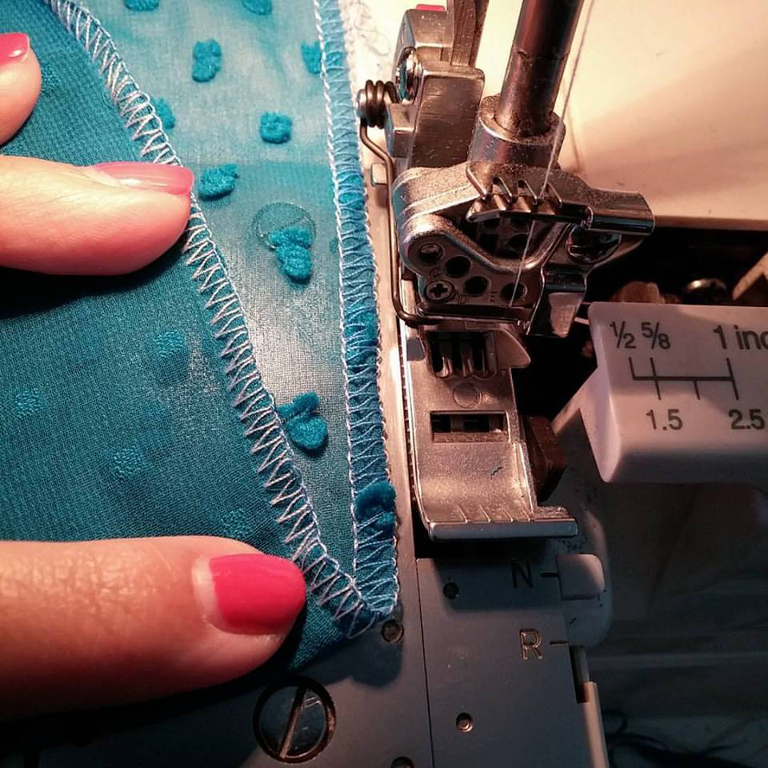 EN Summary: The 2-Thread Overedge Stitch uses only two threads, one on the needle (typically the right overedge needle for a narrower stitch) and the lower looper thread (light blue and turquoise blue, respectively). The upper looper is working as a spreader (not threaded). It's a stitch suitable for overedging (not seaming) sheer to medium weight fabrics. It's both economical (only two threads) and non-bulky. Keep reading for the full article. PT Sumário: O ponto de orlar de dois fios usa (como o nome indica) apenas dois fios: um numa das agulhas de orlar (tipicamente a direita para um ponto mais estreito) e o outro na laçadeira inferior azul-claro e turquesa, respetivamente). A laçadeira superior não leva linha e deve estra a funcionar como distribuidora (usar a alavanca distribuidora). É um ponto adequado para orlar (não é para coser costuras!) tecidos leves a médios. É económico (só gasta duas linhas) e não acrescenta volume às orlas. Continuem a ler para o artigo completo. EN Summary: I'm wearing this dress on my son's 4th Birthday party and couldn't be happier with how it turned out (see more photos over at Tany et La Mode)! Keep reading for all the details and complete sewing review! PT Sumário: Aqui me têm a usar o vestido na festa de Aniversário do meu filho (fez 4 anos) - mais fotos no Tany et La Mode, e não poderia ter ficado mais satisfeita com o resultado! Continuem a ler para verem todos os detalhes sobre o vestido e a sua confeção!